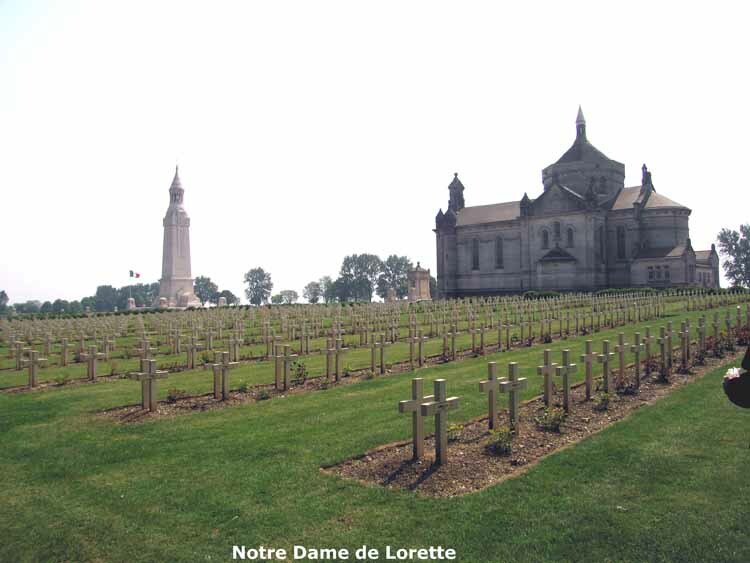 The largest French military cemetery on the Western Front marks the high ground, the Notre Dame de Lorette. 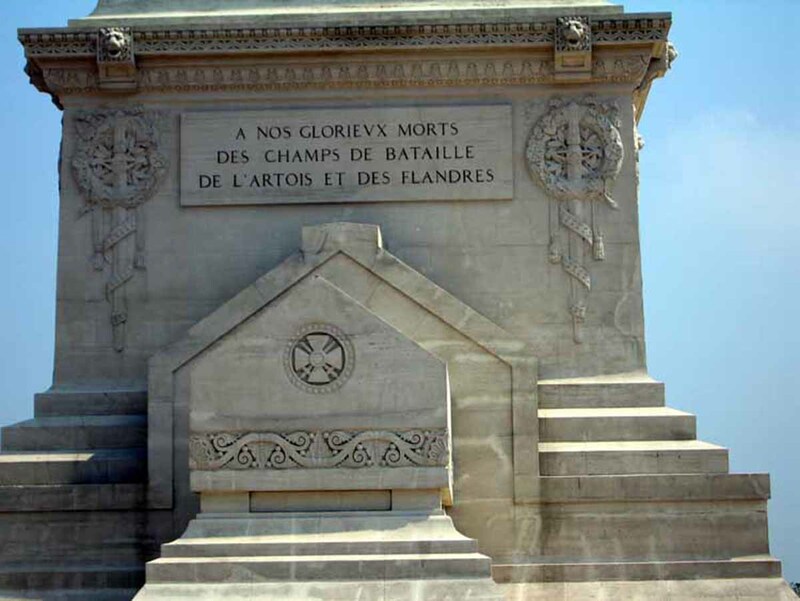 The prize is offered annually for the best historical work on World War One by The World War One Historical Association. It consists of a check for $3,000 and a bronze plaque. 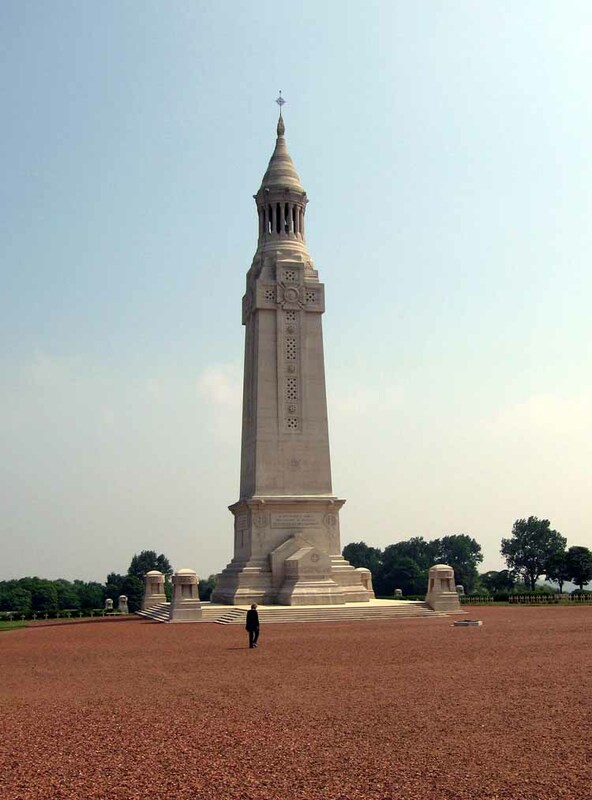 For more information on the programs and publications of The World War One Historical Association, consult our website, ww1ha.org. The winner is chosen by a panel chaired by Professor Dennis Showalter of Colorado College. Other members of the selection panel are Dr. Michael Neiberg of the U. S. Army War College and Amb. Leonard G. Shurtleff, a former WW1HA president. German Assault Troops of World War I, Thomas Wictor, Schiffer, 2011, 339 pages, bibliography, index, appendices, glossary, illustrations, ISBN 978 0 7643 4036 9. $69.95 hb. This profusely illustrated coffee table-size book is typical of the quality of Schiffer Military & Maritime publications. 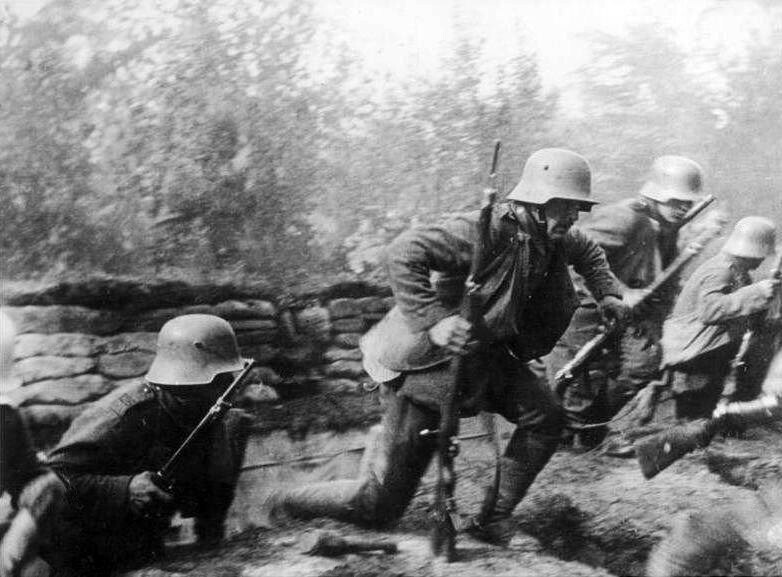 It includes information on the organization, tactics, weapons, equipment, uniforms and orders of battle of the elite stosstruppen who formed the backbone of Ludendorff’s abortive offensives of 1918. Several primary documents are included to illustrate how German tactics and Allied counter measures were developed. The author does not attempt to decide which among the several claimants developed shock troop tactics. Other Schiffer books in this series include volumes on British and French aircraft of the Great War, Italian and Russian aces, the Lafayette Flying Corps, and US Naval Aviation in WWI, as well as any number of volumes on Imperial German uniforms. A fully illustrated catalogue is available from www.schifferbooks.com. German fleet surrendering to the English. 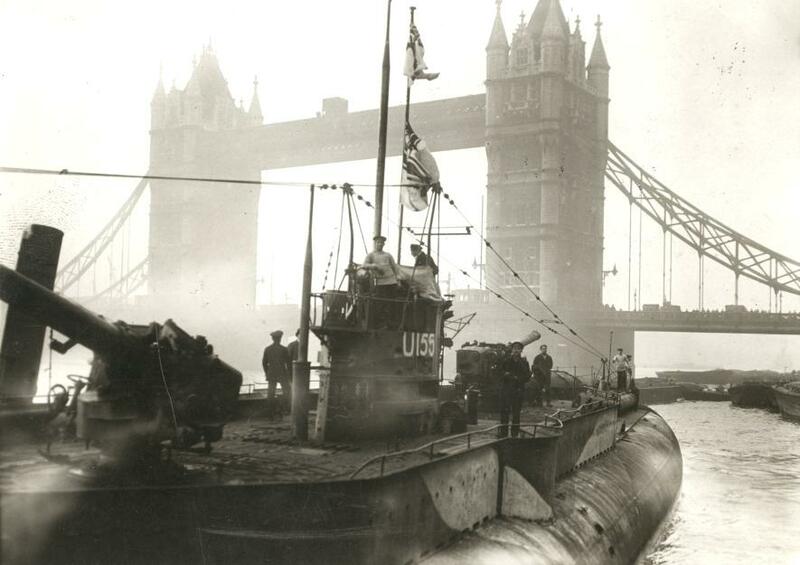 First German U-boat near the Towerbridge. London, England, 1918. The Hidden Threat: The Story of Mines and Minesweeping by the Royal Navy in World War I, by Jim Crossley, Pen & Sword, 2011, 168 pages, charts, diagrams, photos, index, ISBN 978 1 8488 4272 4, $39.95 cloth. Employing speedy converted destroyers and armed passenger liners, Germany mined the approaches to British fleet anchorages and ports beginning in August 1914. Russia used mines to defend her main Baltic bases. The Germans developed several classes of mine-laying submarines some of which had enough range to reach American shores. 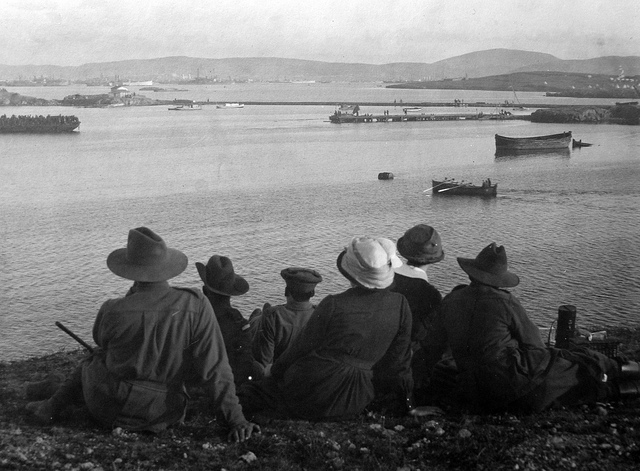 Turkish-laid fields of mines in the narrows off the Dardanelles sank or badly damaged several British and French battleships in 1915. Faced with the proven effectiveness of this silent weapon, the Royal Navy responded by creating a fleet of small minesweeping trawlers, drifters and paddle steamers manned by fishermen and other reservist crews. By 1916, they had also mounted a major mining campaign of their own along the German coast, in the Dover Straits and English Channel expanding these in 1917 and 1918 to the North Sea between Norway and the northern most Scottish islands. Most of the 70,000 mines in this Northern Barrage aimed at containing German U-boats were laid by the US Navy from converted civilian coastal liners. Their effectiveness was disappointing. 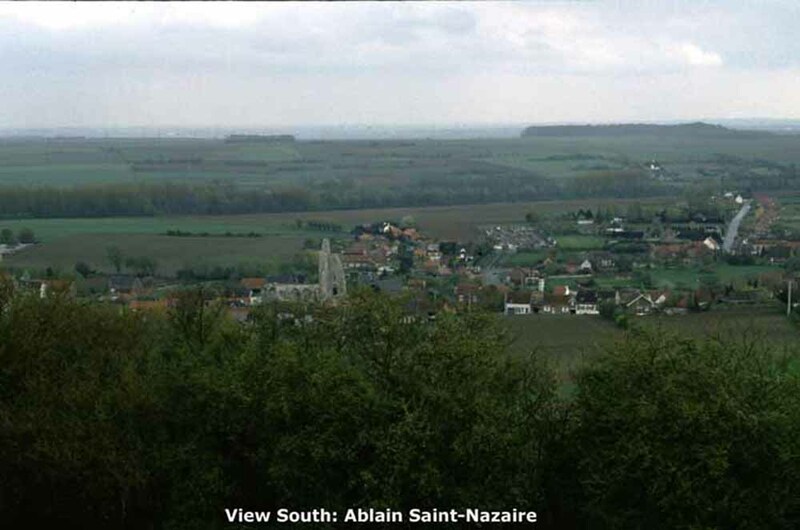 At the most the Northern Barrage sank six U-boats. Mines laid in the eastern North Sea were far more effective in supporting the British Grand Fleet in pinning the German High Seas Fleet in its bases while the maritime trade blockade gradually eroded Germany’s ability to sustain a war of attrition on the Western Front.